You never know when or where a fire will start in your home. What if you could have a firefighter stationed in every room 24 hours a day, ready to stop a fire the minute it broke out? That is what fire sprinklers are—instant firefighters. They are installed in the ceiling or high on a wall and are attached to the same water supply that feeds your home's plumbing fixtures. Residential fire sprinklers are small. In fact, they fit in so well that you have to point them out for people to notice them. You already have water running throughout your home to sinks, showers, toilets and washing machines. Fire sprinklers use the same water to extinguish a fire. Average-sized rooms only need one sprinkler. A sprinkler is similar to a hose nozzle because it breaks the stream of water into a fine spray. The sprinkler does not release the water until it is heated by a fire. A tight metal seal over the waterway holds the water back. The cap is held in place by either a glass bulb or metal link. Both are very rugged but are designed to melt in the high heat of a fire. For example, when a sprinkler with a glass bulb is over a fire in a wastebasket, the fire consumes the oxygen in the surrounding air. The burning creates a narrow plume of smoke and hot gases (e.g., carbon dioxide and unburned carbon monoxide) that rise to the ceiling. When the hot gases reach the ceiling, the heat plume begins to spread out toward the walls. When the hot gases reach the nearest sprinkler, they will heat the fusible element that holds the cap in place. The cap will fall away and the sprinkler will spray water on the fire. Because the water immediately cools the hot fire gases in the plume, the other sprinklers won't open because there is not enough heat to melt their fusible element. In a small number of fires, the burning material produces too much heat for the nearest sprinkler to handle. The adjacent sprinklers then act as backups. If the fire is so hot that the water from one sprinkler cannot cool it, the hot gases will reach the next nearest sprinkler. Then that sprinkler will open to stop the fire. This design of opening only when there is enough heat limits the number of sprinklers to what is needed to stop the fire. 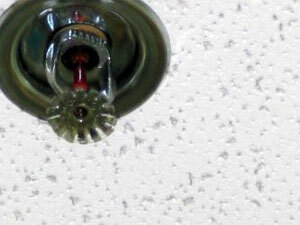 Fire records show that 93 percent of fires are handled by only one sprinkler. In the remaining cases, two sprinklers handled an additional four percent. It took three sprinklers to handle nearly all of the remaining 3 percent. Keep in mind that these figures include large warehouses storing highly combustible goods that generate tremendous heat. In these cases, more than one sprinkler may be necessary to spray enough water to stop the fire. In homes and apartments, it is rare to have more than one sprinkler operate, so the number of fires controlled by one sprinkler in residences is nearly 100 percent. By cooling the fire gases rising from the fire, the sprinkler prevents the fire from reaching the flashover stage. Flashover is a dangerous point in a fire where the unburned carbon monoxide in the gas layer reaches its autoignition temperature and breaks into flame. This occurs after the gas layer has spread to the walls and begun to bank down toward the floor. The radiant heat from flashover ignites all of the combustible items in the room at once, pushing heat and smoke into other rooms. Once the water from the sprinkler has stopped flashover, the spray will begin reaching the burning material and cooling it to below its combustion temperature. Then it can no longer burn and the fire goes out. Responding firefighters will shut off the sprinkler once they are sure that the fire is completely out. Information provided by the Residential Fire Safety Institute Web site.